This article is about the US comic book crossover. For the UK comic book, see Marvel Heroes Reborn. "Heroes Reborn" was a 1996–97 crossover story arc among comic book series published by the American company Marvel Comics. During this one-year, multi-title story arc, Marvel temporarily outsourced the production of several of its most famous comic books to the studios of its popular former employees Jim Lee and Rob Liefeld. Cover of Onslaught Reborn #2. Art by Rob Liefeld. Following the apparent deaths of the Avengers, the Fantastic Four, and Dr. Doom battling Onslaught in Onslaught: Marvel Universe, they were "reborn" and certain aspects of their earlier stories were expanded with the intent of telling their adventures anew for modern generations. This was explained, in-story, as their having been transported into a pocket universe by Franklin Richards, the near-omnipotent, psychic son of Mr. Fantastic and the Invisible Woman, to save them, where they lived in the so-called "Franklin-verse", oblivious to what had happened to them. The characters' origins and histories were revised and updated circa mid-1990s for modern audiences. For instance, Ben Grimm fought as a pilot in the Gulf War instead of World War II, and Susan and Johnny Storm were explained to have been financial backers for Reed Richards' rocket, hence their presence on the mission. In addition, while Richards' goal of becoming the first man to get to Mars remained, it was revealed that he secretly aimed to explore the interstellar anomalies of that area. For this reworking, Marvel "farmed out" the properties to some of their former employees who had left the company to form Image Comics. Jim Lee's WildStorm Productions studios handled Fantastic Four and Iron Man, and Rob Liefeld's Extreme Studios took the reins of The Avengers and Captain America. However, after six issues, Marvel ended Liefeld's contract early, citing low sales on his two titles. Liefeld's titles were reassigned to Lee. 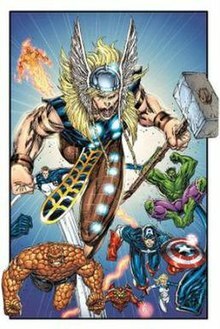 Walt Simonson took over Avengers when it moved to WildStorm. Although the four titles in "Heroes Reborn" were slated for a 12-issue run, James Robinson wrote a thirteenth and final issue for each book. The storyline, entitled "World War III", was a crossover between the Marvel and WildStorm characters. The changes to the characters were controversial, provoking debates amongst fans. The change in creative team on Captain America was also controversial, since the pre-Heroes Reborn team of Mark Waid and Ron Garney had already been bringing increased sales and critical acclaim to the series. However, all of the titles experienced a large upsurge in sales. According to Lee, Marvel proposed continuing the Heroes Reborn lineup indefinitely, but under the condition that Lee would draw at least one of them; Lee refused. At the end of the storyline, the Fantastic Four and Avengers were returned to the mainstream Marvel Universe, again through the intervention of Franklin Richards, in the miniseries Heroes Reborn: The Return. The ensuing storyline, dubbed "Heroes Return" was once again created in-house at Marvel Comics. The Heroes Reborn saga continues on Heroes Reborn: The Return, a four issue limited series (December 1997). In the story, the Celestials took notice of Franklin's pocket universe and initially demanded that he now eliminate one of the two universes, but finally relented on the condition that all beings native to Earth-616 evacuate the pocket universe and never return. The heroes are gathered in a massive ship to leave the pocket universe. Characters as She-Hulk and several members of the Inhuman Royal Family were depicted as returning heroes, even though they were not among the missing heroes from Onslaught: Marvel Universe. As the heroes are travelling to their destination, Dr. Doom suddenly makes an escape out of the ship with Franklin, hoping to use the siphoning devices he created to steal Franklin's power. However, Doom is stopped by Mr. Fantastic and Thor who rescue the boy. Thor uses his hammer to create a portal, trapping himself and Doom on it. As soon as the remaining heroes break the boundaries between the two worlds, they all suddenly remember their past lives. Bruce Banner and the Hulk are merged back together into one singular being. The returned Anthony Stark possesses the memories of both the original and teenage Anthony Stark, and thus considers himself to be essentially both of them. The pocket universe was then placed under the authority of Ashema the Listener. Eventually, Thor is returned to Asgard, while Doom's whereabouts are left unknown. In 1999, Marvel collected Heroes Reborn: The Return #1-4 limited series re-titled as the Return of the Heroes trade paperback. It was re-released in 2009 as Heroes Reborn: The Return trade paperback again collecting the 4-issue mini-series, and also the Heroes Reborn one-shot specials from 2000: Doomsday #1, Ashema #1, Masters of Evil #1, Rebel #1, Remnants #1, Young Allies #1, and Doom #1. In July 2000, Marvel published the trade paperback Fantastic Four: Heroes Reborn, collecting Fantastic Four vol. 2, issues #1-6 under the 'Marvel's Finest' banner, but no other "Heroes Reborn" reprints followed for some time. With 2006 marking the 10th anniversary of the "Heroes Reborn" crossover, Marvel marked the occasion by having the reality-traversing Exiles team visit the "Heroes Reborn" Earth, in Exiles #81-82. The company also announced it was reprinting original "Heroes Reborn" series and produced trade paperbacks collecting issues 1-12 (excluding the series finale cross-over "World War III") of the four titles. A new edition of Heroes Reborn: Fantastic Four trade paperback was released in August 2018 ISBN 1-3029-1333-6. Also, Marvel announced that Jeph Loeb and Rob Liefeld would reunite in November 2006 for Onslaught Reborn, a five-part weekly limited series that would feature both Onslaught and a world similar to the "Heroes Reborn" universe. This was planned to tie in with the memorial scholarship fund established in honor of Loeb's son Sam. ^ a b McLauchlin, Jim (August 1997). "Lee Extends 'Reborn' Run". Wizard (72). pp. 18–19. ^ "An interview with Walt Simonson". Archived from the original on 2007-10-17. Retrieved 2007-10-18. ^ Senreich, Matthew (August 1997). "The Wizard Q&A: Mark Waid & Ron Garney". Wizard (72). pp. 68–72. ^ Miller, John Jackson. "Capital Sale Tops Turbulent Year: The Top 10 Comics News Stories of 1996". CBGXtra. Archived from the original on 2007-11-07. Retrieved 2007-12-20. ^ Iron Man vol. 3 #1. Marvel Comics. ^ Heroes Reborn: The Return #4. Marvel Comics. ^ Avengers vol. 3 #1. Marvel Comics. ^ "Ten Years Later: Onslaught Reborn". Archived from the original on 2007-10-12. Retrieved 2007-12-20. ^ "Onslaught Reborn #1 Preview with Loeb & Liefeld Video Interviews". Archived from the original on 2007-12-24. Retrieved 2007-12-20.